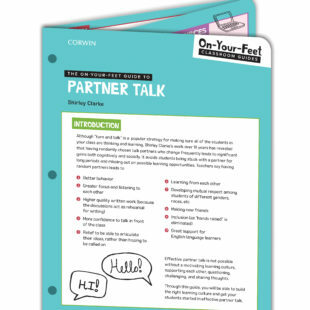 On Your Feet Guide to Partner Talk - Shirley Clarke Media Ltd. Most teachers are familiar with the “turn and talk” and “think-pair-share” strategies for partner talk. However, there is a more effective way to do partner talk that results in better behavior, greater focus, higher quality work, and greater confidence in learning. Backed by over 18 years of research, Shirley Clarke shares a tried and true method for engaging students in learning through randomly chosen talk partners.